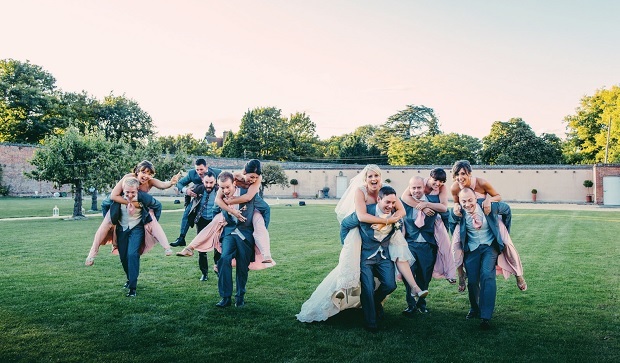 Kelly and Lee shared their English country garden wedding with friends and family at Hexton Manor. Kelly's fairytale began at a New Year's Eve party in a castle in Scotland. The only thing missing was a pair of glass slippers when she met Lee, her prince charming, as the clock struck midnight almost six years ago. The duo hit it off immediately and soon after, planned their first date. “We went for a few drinks in Harpenden and laughed and chatted the whole time,” remembers Kelly. “At the end of the night, I challenged Lee to a round of shots - I felt really queasy in the taxi on the way home,” she says. The proposal came a few years later in New Zealand. 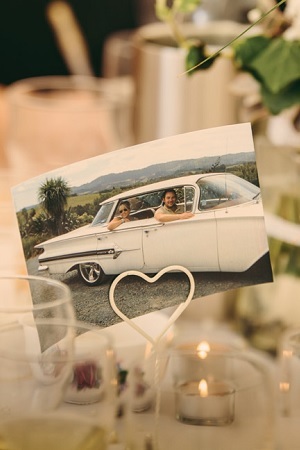 Lee chose Cathedral Cove, a stunning beach on the Coromandel Peninsula, as the perfect backdrop for the big question. “Lee knows that's my favourite place in the whole world and he completely took me by surprise by asking me to marry him. I wasn't expecting it at all,” recalls Kelly. The pair decided on an English country garden theme for their special day and the surroundings at Hexton Manor suited them down to the ground. “The fact that we were able to get married outside on a beautiful sunny afternoon made the day for us. 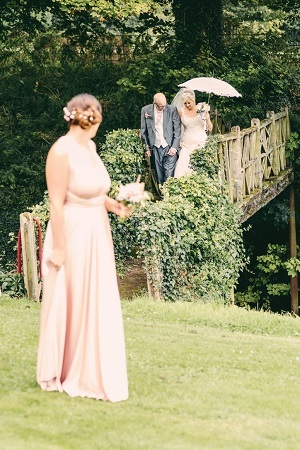 I got to walk over the bridge, linking arms with my dad and holding my mum's vintage bridal parasol. It was perfect,” says Kelly. 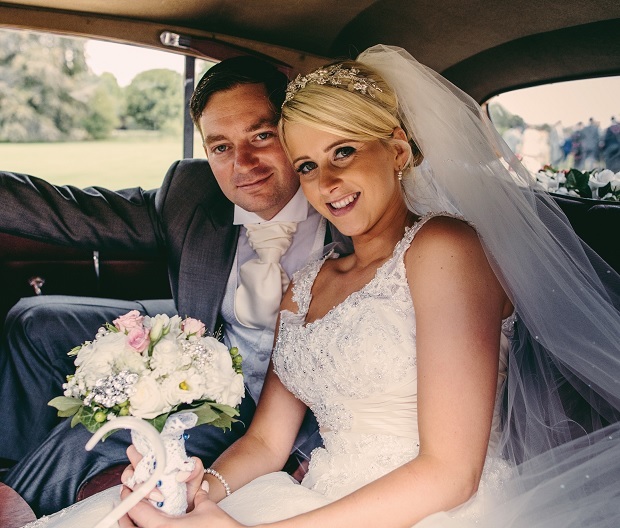 Kelly Gregory, 29, married Lee Brooks, 31, at Hexton Manor, followed by a reception in the venue's Walled Garden on 23rd August, 2014. After a couple of hair trials, I knew that I wanted an elegant up do. My headpiece was beautiful and I had little pearls in my hair that emphasised the detail in my dress. I felt a million dollars in my dress. 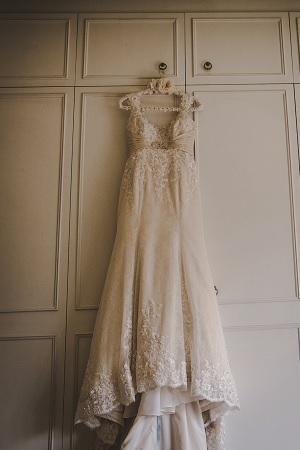 It had Swarovski crystals all over it that shimmered every time I moved, and the lace was so delicate and intricate. 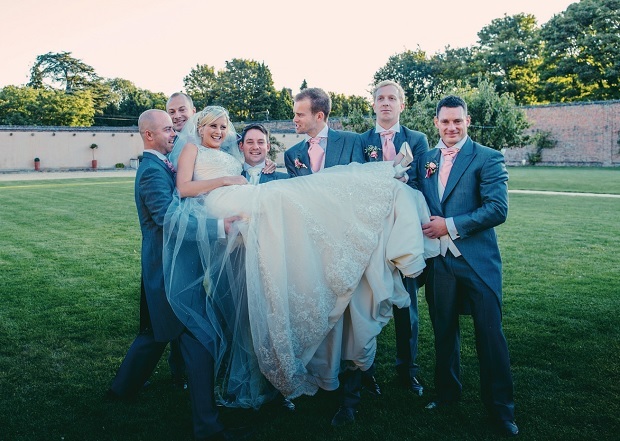 Lee chose his two close friends from school to be his best men. They, along with his ushers, all wore grey morning suits. The bridge that we walked over to the ceremony was beautiful. It really added a magical feel to our day. The time spent with my dad before the ceremony was very special. I've dreamt about that moment since I was a little girl. 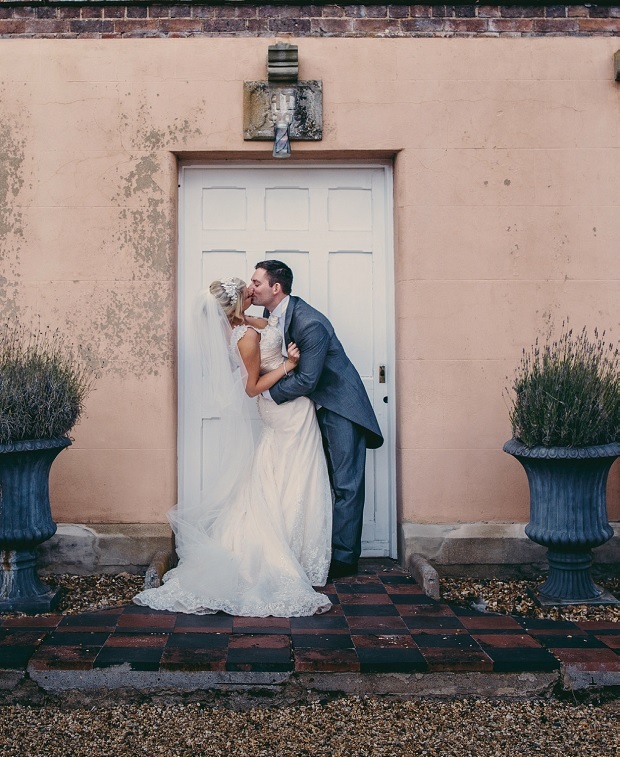 We fell in love with our venue straightaway; the surroundings were beautiful and suited our English country garden theme perfectly. 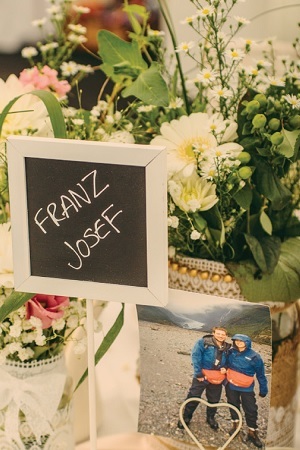 Our tables were named after our favourite places in New Zealand and we used decorated jam jars, milk jugs and watering cans filled with flowers as our centre pieces surrounded by tea lights and scattered pearls. The decorations were really personal and varied. We used photographs of us taken over the years to display around the venue. Our guests had to walk through a secret door to the Walled Garden where we hosted our reception. It reminded me of my favourite childhood film, The Secret Garden. 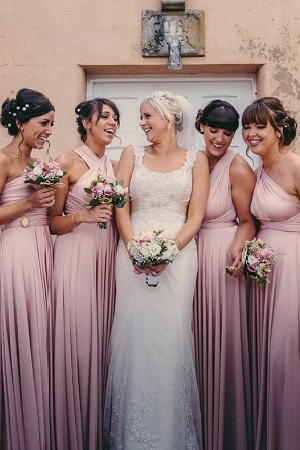 My best friends Carly, Ami, Claire and Deborah all looked stunning in their bridesmaids' dresses. They could be worn in 15 different ways, so we had fun Watching YouTube clips on how to wrap them. 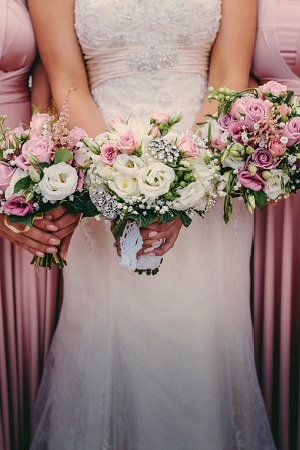 My bouquet was made up of white and pink roses and gypsophila wrapped in hessian to match our country theme. Lee's nan sadly passed away in the December before our wedding, so I included a few of her brooches in my bouquet so we felt that we had her with us on our special day. Our photographer was very talented. She knew exactly the sort of fun, natural shots we were after. 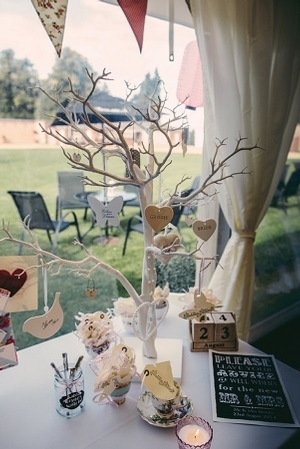 Guests were invited to hang messages on the wishing tree that I decorated with my bridesmaids. 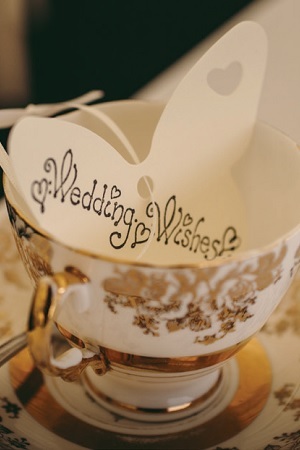 We decided to use vintage teacups and saucers to add a traditional English feel to our décor. 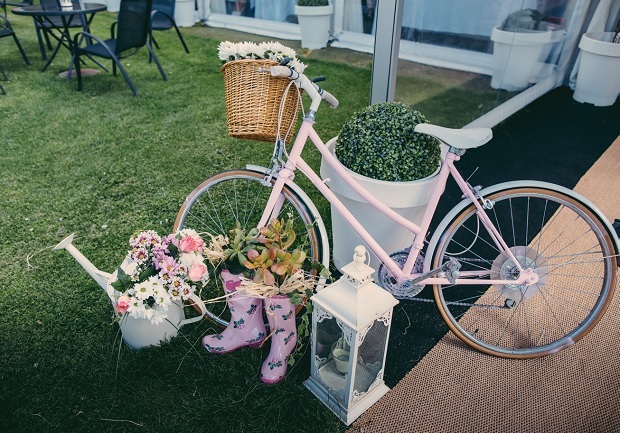 Pink and blue vintage bikes adorned the entrance to the marquee alongside wellies filled with flowers, which were a real talking point. 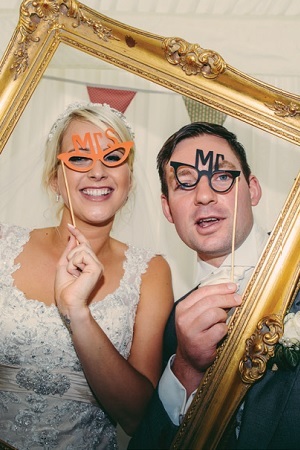 Our guests had so much fun with the fancy dress prop box and photo frame; we've got loads of hilarious pictures to look back on. For our cake, we decided to have a traditional ivory top tier with cupcakes below decorated with flowers and butterflies. 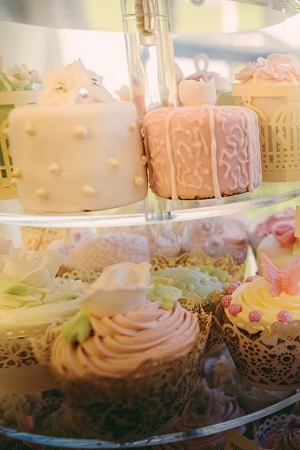 To add a fun twist, we also had ivory and pink cake pops. 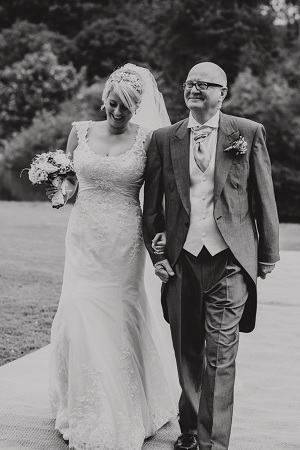 Our special day was exactly how we'd imagined – it was just perfect.